Road and airfield flexible pavement design methods are similar in that load-induced strains are estimated using layered elastic methods. Pavement life is predicted using material performance relationships that relate the strains generated within pavement layers and the subgrade to performance of pavements under full-scale loading. 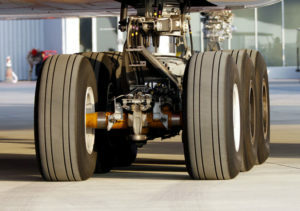 The arrival of new generation aircraft such as the Boeing 777 and Airbus A380, both of which have 6-wheel configurations was the major impetus for new full-scale tests to improve the pavement design methods for such aircraft. The state of the art flexible pavement design method is based on APSDS 5.0 (Aircraft Pavement Structural Design System). APSDS 5.0 uses the latest calibration that takes account of the new test data. APSDS 5.0 has separate calibrations for 1, 2, 4 and 6-wheel configurations. This approach gives better correlations between design outputs and the calibration data than achieved by previous calibrations that did not treat the different configurations separately. With this new calibration, APSDS 5.0 pavement designs are thinner than given by the FAA design software, FAARFIELD. Click here for more details and sample designs for A380-800, B747-400 and B777-300 aircraft. For further details see the article: Wardle, L. and Rodway, B. (2010). Advanced Design of Flexible Aircraft Pavements. 24th ARRB Conference, Melbourne, Australia. Download: Advanced Design Of Flexible Aircraft Pavements. Wardle, L. and Rodway, B. (2010). The Airport Pavement Structural Design System (APSDS) software will streamline your runway and taxiway pavement design projects. The optimization feature gives designs that are cost-effective and reliable. 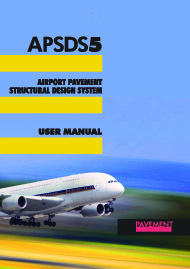 APSDS enhances the complex and demanding task of airport pavement design, construction and maintenance. One of the unique features of APSDS is that it takes rational account of aircraft wander. Wander is the measure of how successive aircraft deviate from runway or taxiway centre lines. Increased wander reduces pavement damage by different amounts that depend on pavement thickness. Incorporating wander can lead to significant savings in construction costs.